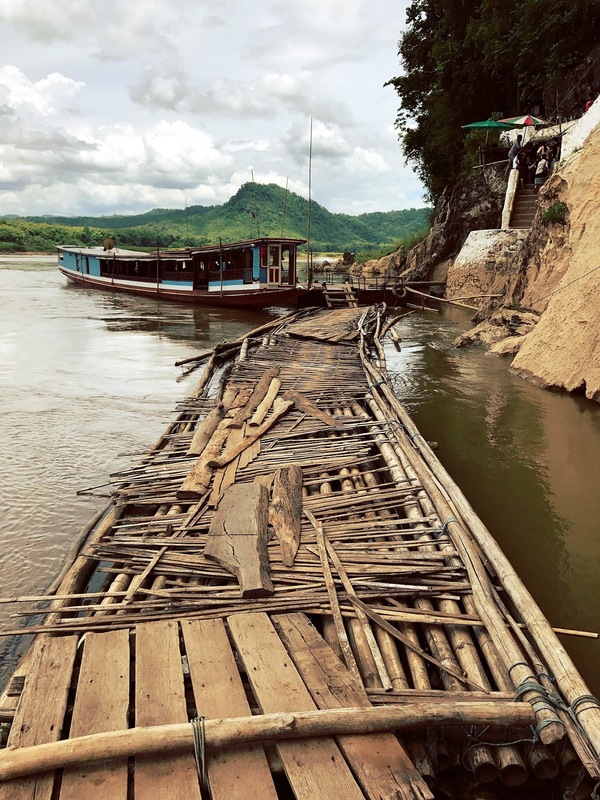 Northern Thailand and Laos – Sometimes the wrong train will get you to the right place. After a fairly painless border crossing, we hopped in a shared taxi to the other side of Mae Sot. Once we arrived, we had just about 5 minutes to kill until the next northbound bus to Chiang Mai. We hadn’t eaten all day and were all veritably starved, but we managed to secure some (not particularly noteworthy) pad thai from a food stand just as the bus driver was about fed up with our stunts. We ran back over to the bus just in time for us to head out. After another four or so hours on the road, we were finally in Chiang Mai, Thailand’s fourth largest city, and the undisputed cultural capital of the north. We had just about enough energy to go and get a few beers, and we managed to stay up a whole lot later than we were used to. Chiang Mai was proving to be very pleasant from the get go, certainly a touristy affair, but the weather was a nice change from the hot and humid Yangon. Likewise, there are a handful of bars in the old town ranging from raucous parties to nearly completely dead. We settled on a bar of the latter sort, and just barely made it back to our hotel before we collapsed from the toll of the day’s activities. By sheer chance, some friends of Ian’s from long ago, Vedrana and Steven (another couple in the midst of world traveling) happened to be in Chiang Mai at the same time as us. Ian spent the following day with them, heading out to Doi Suthep for a bit of trekking and waterfall exploration. Oona hung out in town with Sara and lived through the unspeakable agony of getting two hour massages, shopping, and having afternoon cocktails. We all joined up in the evening for some more drinks and dinner. Much drink was consumed, and Oona and Ian ended up shuffling back to our hotel at nearly 1am. By far the latest we have been out since, well, a long time ago. It was wonderful catching up with them, and we had a very enjoyable night all around. The following day, however, was not so enjoyable, and most of it was wasted on lounging around the hotel trying to cure our headaches. We headed over to Kanjana for a late dinner. This joint is known for its Northern Thai specialties, so we doubled down on a bit of that. Oona got the khao soi, which is a curry noodle soup dish which was off the chains delicious. Perhaps one of the best plates of food we’ve had in a long time. Ian opted for the kaeng hang le with sticky rice, which was also totally amazing. We’d give it a solid 9/10. 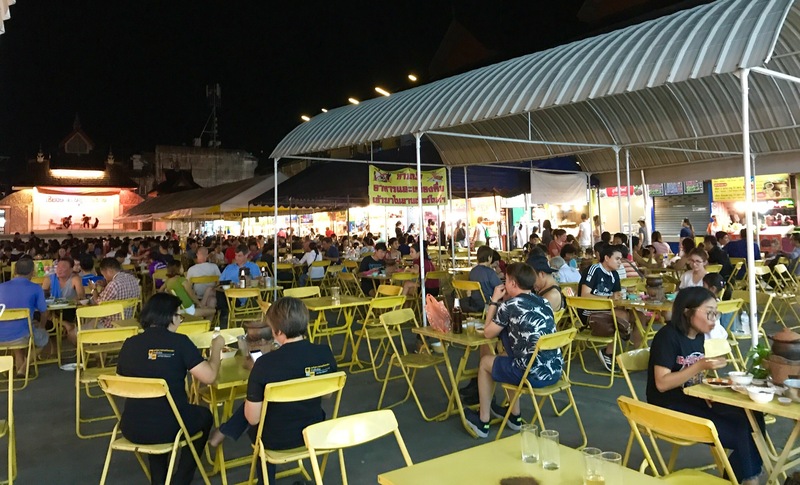 As we were preparing to head home, we managed to muster up the energy to take a look at the famed Chiang Mai Night Bazaar. 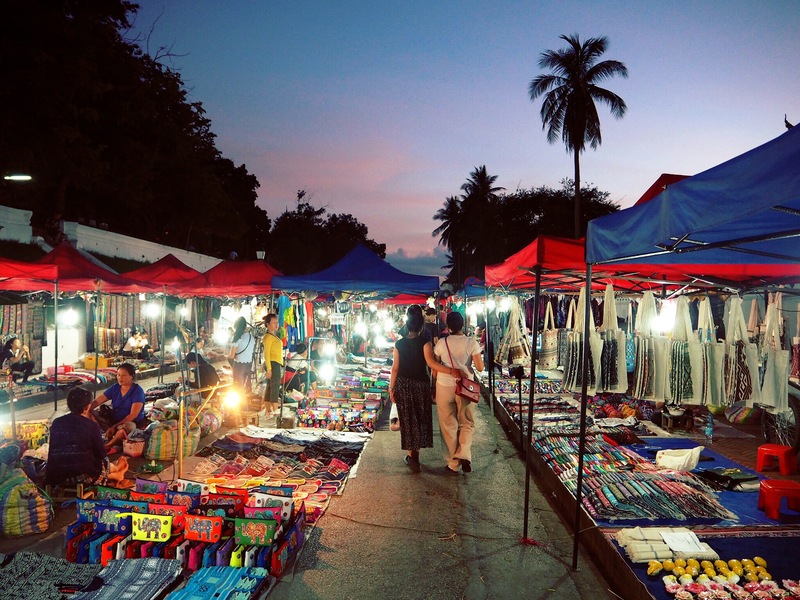 There were a ton of tourists, and all the sorts of things that cater to that crowd, so we didn’t find much of a ton of interest, but we’re glad we saw it, and we concluded that at the very least, it is a very big market, stretching for blocks and blocks. We moseyed on over to the Arcade bus station on the east side of town the following day for our 11am departure to Chiang Rai, the similarly-named town not too far north of Chiang Mai. The bus took some three hours before it rolled into the dusty lot that is Chiang Rai’s bus station. On our first day in town we sprung for yet more Northern Thai cuisine, as we were quickly coming to learn that it’s the best there is in Thailand. A bowl of khao soi and plate of sai ua later and we were all but entirely convinced of the rapturous deliciousness of this particular cuisine. 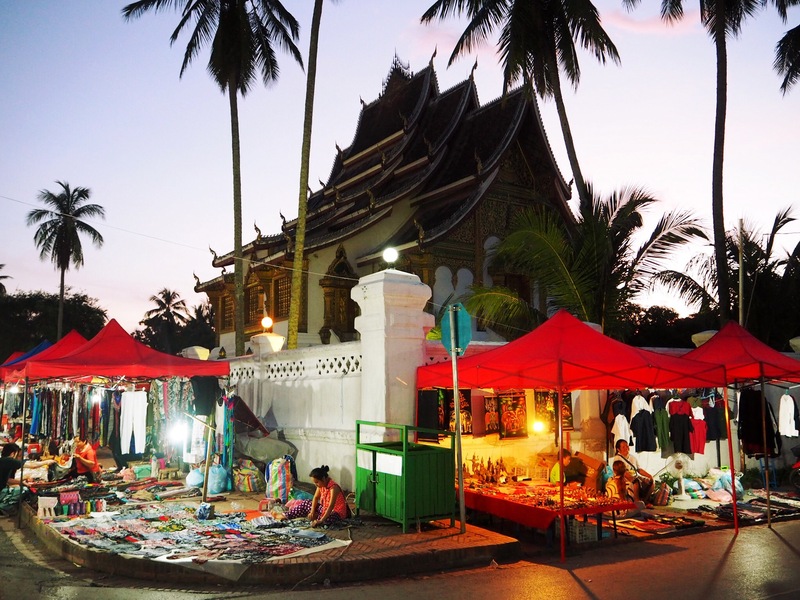 We visited the Chiang Rai night market as the sun set, and had a leisurely walk through the place. It was much more relaxed than its Chiang Mai counterpart, but still did not offer much that we wanted. We had some mediocre pad thai in the food section, and headed back home. The night market in Chiang Rai. The next morning we had a fantastic breakfast at Thamma Da Coffee House on the shores of the Kok River, a little outside the center of Chiang Rai. The space is beautiful, in a couple old buildings with a lovely garden overlooking the river. The bar looked wonderful too, but we supposed it was a little too early to be drinking cocktails. After breakfast we visited the Baan Dam (Black House) museum, which is weird in a very fascinating way, to say the least. 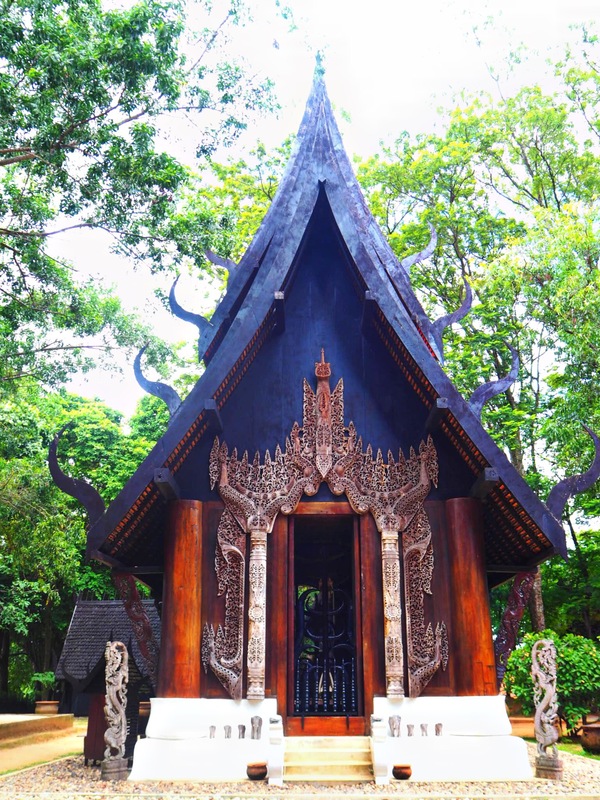 It’s essentially the antique collection of Thawan Duchanee, an eccentric local artist, spread across a number of buildings in a large yard. 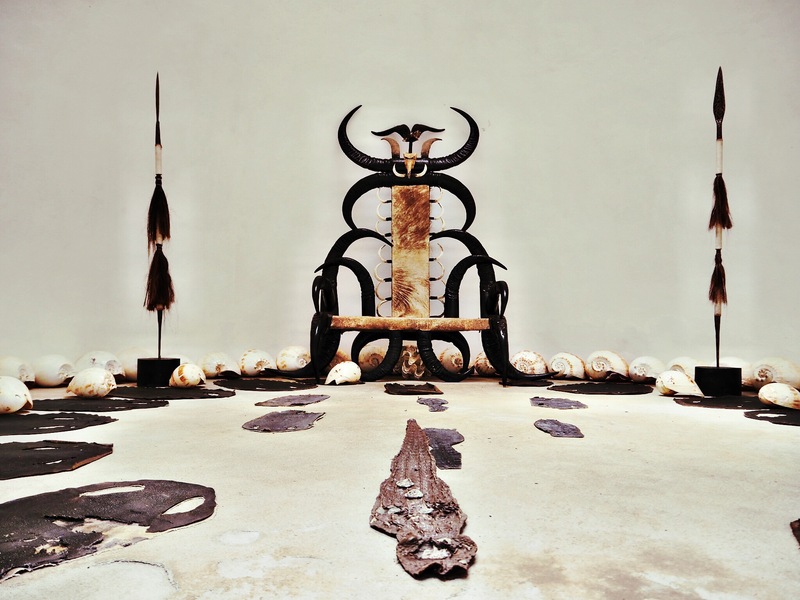 The buildings themselves are quite beautiful, and the antiques inside –ranging from ornate chairs of carved horns to alligator and anaconda skins– were stunning, and replete with phallic symbolism. We spent an hour or so wandering around the grounds, often wishing that we could run off with something like an ornate, carved bed frame or a several ton statue. Not so subtle phallic symbolism here. 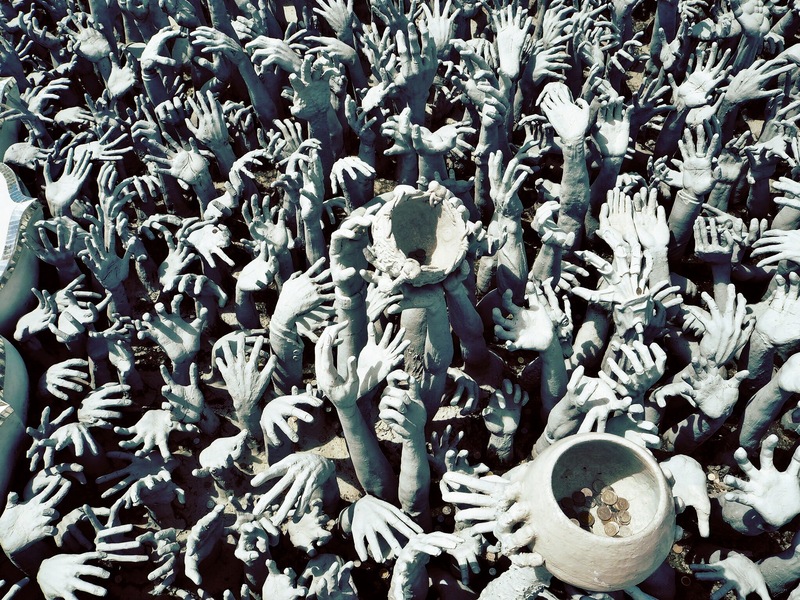 After Baan Dam we headed to its antithesis, Wat Rong Khun (White Temple) on the opposite side of town. 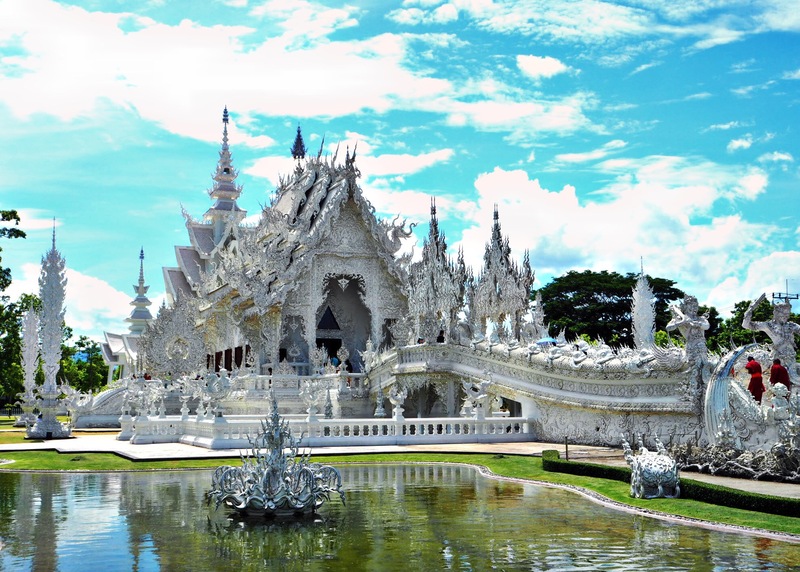 Wat Rong Khun is a massive contemporary buddhist temple of white and glittering material. The result is pretty spectacular, but just as weird as Baan Dam, if not weirder. 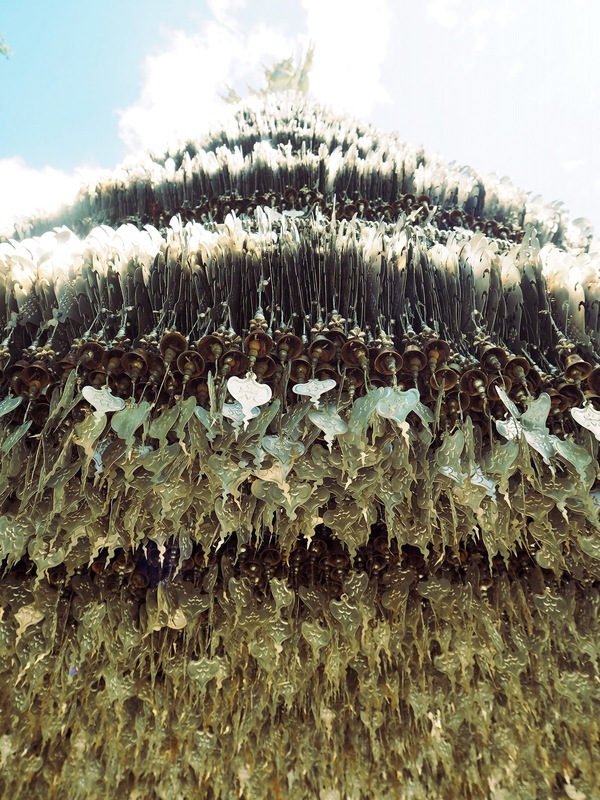 The symbolism of the place is perhaps its greatest draw, with no shortage of morbid and macabre. Looking off the side of the bridge towards the temple presents a sea of outreached arms –some human, some demonic, some cybernetic– all grasping for an escape from the underworld. Many similar objects dot the area. There’s a massive bust of the monster from the 1987 film Predator, for example, and an airbrushed painting of the burning World Trade Center on the interior wall of the temple. Nevertheless, there were a number of robe-clad buddhists praying here as well, apparently undeterred by the surrounding anguish. The underworld, we’re led to assume. Our third and final stop for the day was the Kayan village near Chiang Rai. 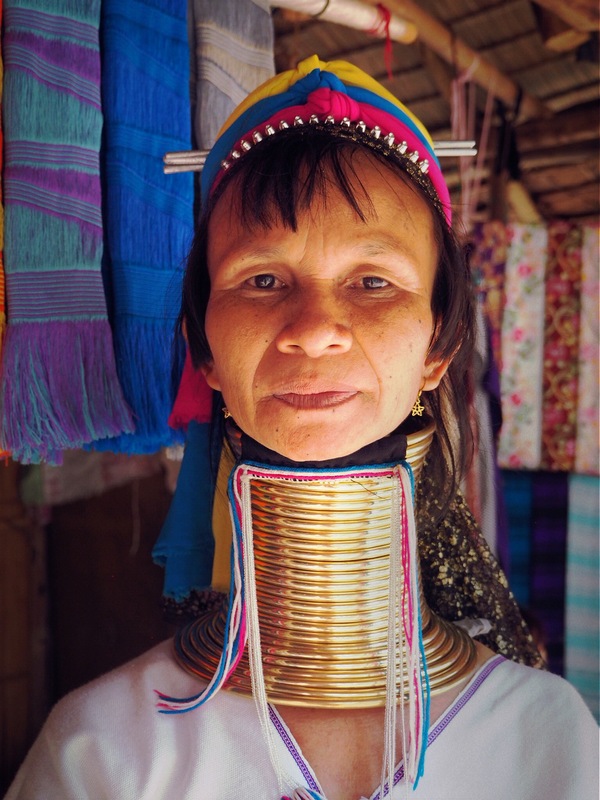 The Kayan people are most well known as the ones who elongate their necks, using inserted metal bands, resulting in the women having startlingly long necks. The village itself is sort of like a zoo, where the tourist walks along a predetermined route to observe the locals who hawk their souvenir trinkets. The phrase 50 baht! 50 baht! is heard frequently. The whole thing sort of weirded us out, as it was so thoroughly commercialized. Nevertheless, we observed, like everybody else, and bought some low-grade souvenirs to provide some sort of income to these people. We contemplated what it would be like to grow up in such a place, with a constant throughput of tourists ogling at your customs and ways of life for a few hundred baht in return. We can’t talk too much trash though, because we were there after all, contributing to the problem. Pretty weird experience overall, that we would likely not do again, but it was definitely interesting to see. Kayan woman, near Chiang Rai. Probably upset at having her picture taken for the millionth time. Akha woman, near Chiang Rai. We determined that there is a bus that goes from Chiang Rai directly to Luang Namtha in Laos, which was our next destination, on Mondays, Wednesdays, Fridays, and Sundays. This bus leaves from Chiang Rai’s terminal 2, some 5km south of the city, and is operated by a company called 999. We reserved our spots on the bus for the following day, but were told we didn’t need to pay until the next day. The ticket was 500 baht per person, which is considerably more expensive than the alternative (bus to the border, cross the border, bus to Luang Namtha). The bus goes all the way from Chiang Mai to Luang Prabang, taking some 18 hours for the whole trip, but the length between Chiang Rai and Luang Namtha took a little over six. The bus itself is a sleeper (which is sort of weird since it leaves at 9am and arrives at 3am) and we were given one “compartment” on the bottom floor (which only has a narrow window space and a low ceiling), which we could both fit into relatively comfortably. There were a few bathroom breaks, and an hour or so at the border to allow for people to get their on-arrival visas and stuff, but after Chiang Rai there was no stop for food until Luang Namtha. The journey itself is a little miserable though, with a very curvy road after the border. We did not envy those that needed to stay on until Luang Prabang. We got off the bus and hung around the mostly derelict station until somebody started paying attention to us. This was a little weird considering most bus stations have hordes of taxi drivers screaming for your attention as soon as you step off the bus. We eventually found a couple songthaews parked in a corner of the lot, and began the process of trying to find one that could take us into town, which is about 10km north of the bus station. We were apparently the only ones going, so we had to pay a bit more than usual, 25,000 kip (about $3) per person. Our accommodation (Thoulasith Guest House) was quite nice, with only a few other laid-back looking westerners hanging around. The staff spoke little English, but we managed to check in without issue, and immediately headed across the street to the Bamboo Lounge for the some food. We were dismayed to find that they only had western food on the menu, but it turned out to be reasonably good, and the cold beers were definitely crucial. 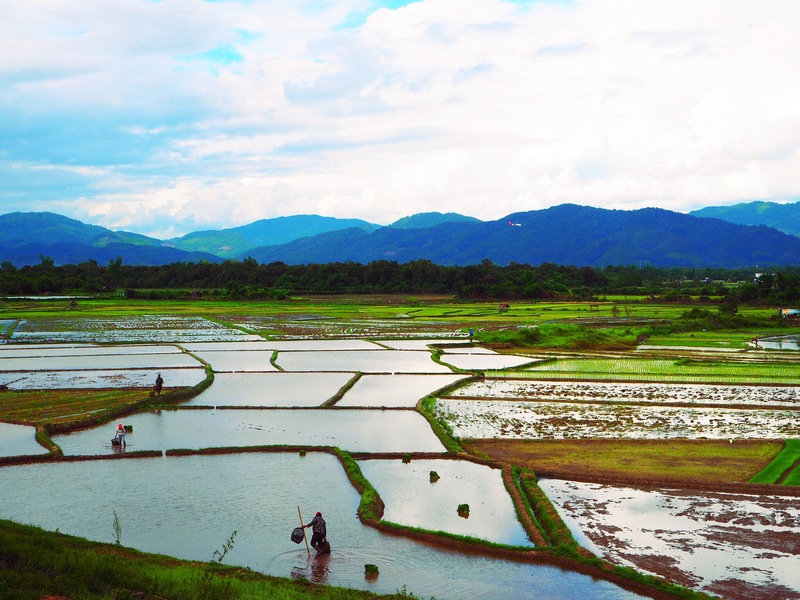 Rice paddies near Luang Namtha. We spent the following day on a rented motorbike simply exploring the area. There’s not a ton to see, and the primary attraction of the place is the trekking tours organized out of the town, but trekking in 30° heat gets old pretty fast, and we had already seen a handful of the ethnic villages that are the main target of these sorts of things. Exploring the area around town is nice enough for a day though, so we just cruised around the highways, went up to the pagoda south of town, and just soaked up the small farm town vibe. Most of the land around the town is occupied by rice fields, and most of the townspeople spend the day working those fields. One of the “main roads” through the region is a rutted out path that crosses a narrow bamboo bridge over rushing waters. Ian pushed the motorbike across, which is one of the most terrifying things he has done, as he almost lost balance a few times and either fell backwards himself or dropped the motorbike off the other side. Fortunately we both escaped unscathed, with motorbike in tow. 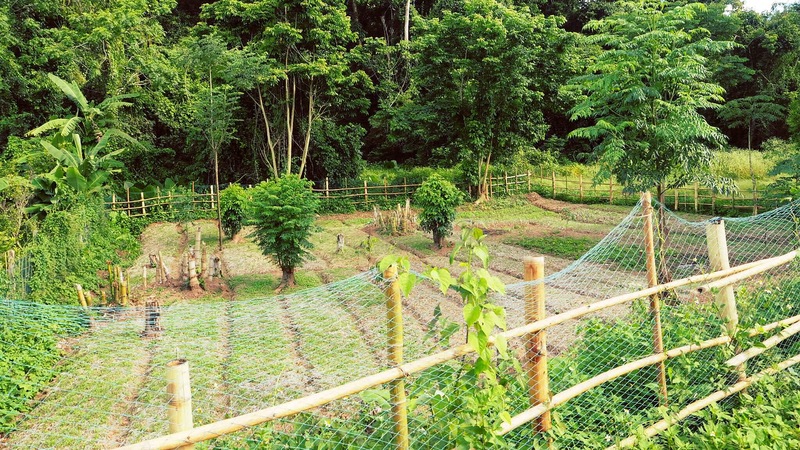 A farm in the woods. 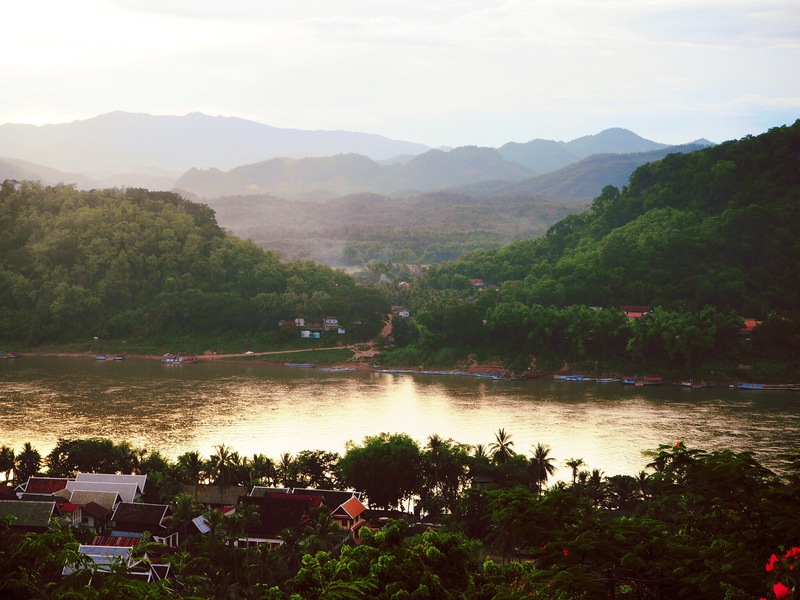 We left Luang Namtha to head to Luang Prabang, Northern Laos’s crown jewels. We opted for the minivan, as it’s considerably faster than the bus. 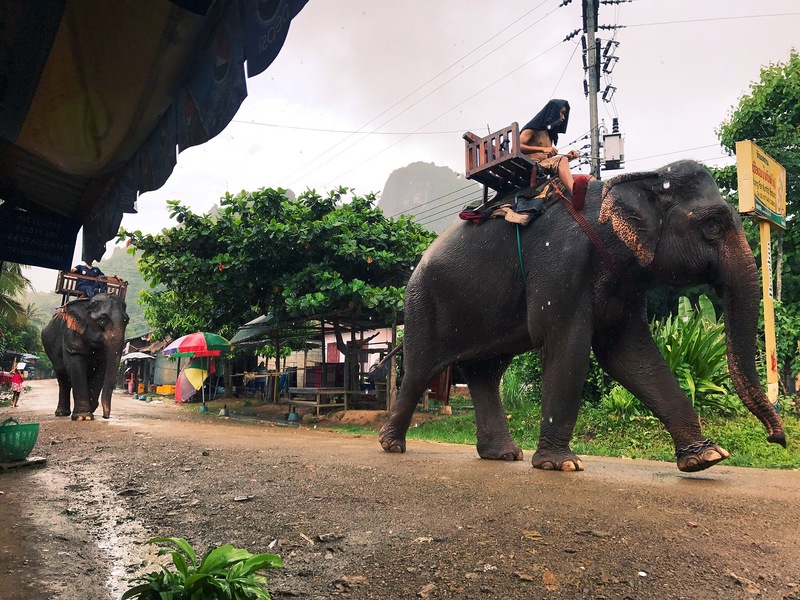 It’s scheduled to take eight hours, but our driver was a bit of a maniac, and we didn’t stop much, so it took just about six before we came rolling into Luang Prabang. It was much more terrifying than it looks. We checked into our hotel, Sa Sa Lao, which was a bit of a gamble. We saw online that it had no AC, and was basically an open-air bungalow in the jungle. The other shots of the property looked beautiful though, and indeed, the main draw of the place was the deck overlooking the Nam Khan river. Our room was indeed very hot, and dark, and the fixtures in the bathroom were constantly dripping water. There were several huge spiders and other various insects crawling around the joint, and we concluded that we would not like to stay there for the four nights that we had initially booked. We told the reception that our plans had changed and they (thankfully) refunded the three following nights. We found another place on booking.com for the remainder. We spent the evening strolling around town. The town is really lovely, and it’s not surprising that many people have talked of it as the highlight of their Southeast Asia trip. The European influence from the French colonial days is very palpable, and the night market even has nice stuff. It’s certainly touristy, but not nearly as much as places in Thailand. Mekong river in Luang Prabang. 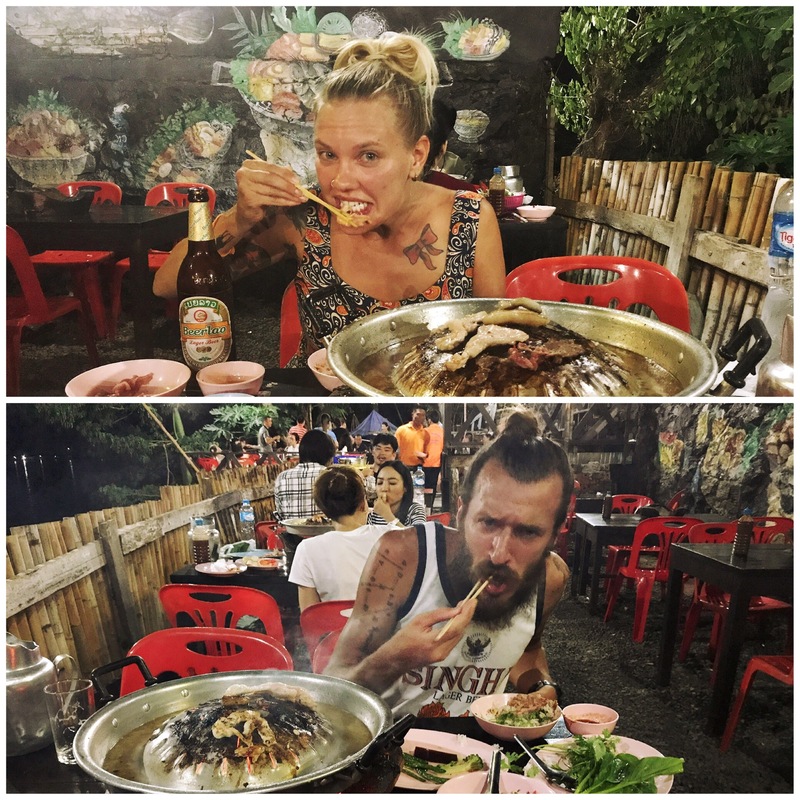 The night we were condemned to spending at Sa Sa Lao was even worse than we were expecting. Admittedly we turned in a bit early, and were prepared for people to be socializing until midnight (the start of the quiet hours). There ended up being a big group singing and drinking on into the night, until 2am or so. Poorly-sung hits from the karaoke bar across the river came echoing over until the wee hours as well. This, along with the unbearable heat, guaranteed a restless night for us. 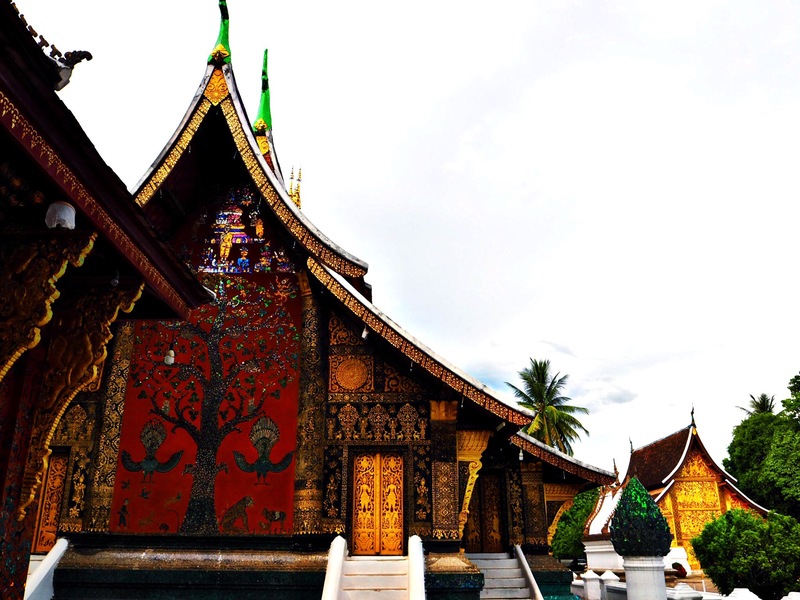 A temple in Luang Prabang. 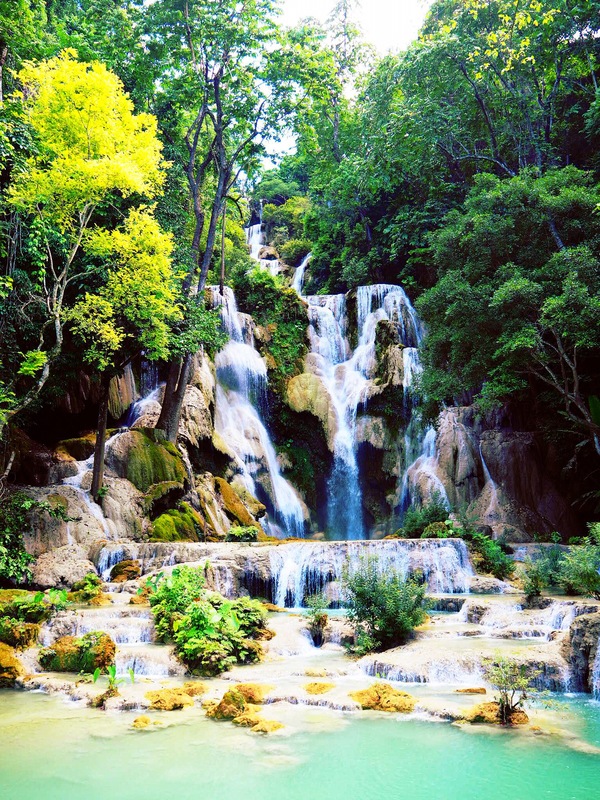 We headed out to the Kuang Si falls south of Luang Prabang the following afternoon. The ride out there was beautiful, along a very pleasantly uncrowded road. 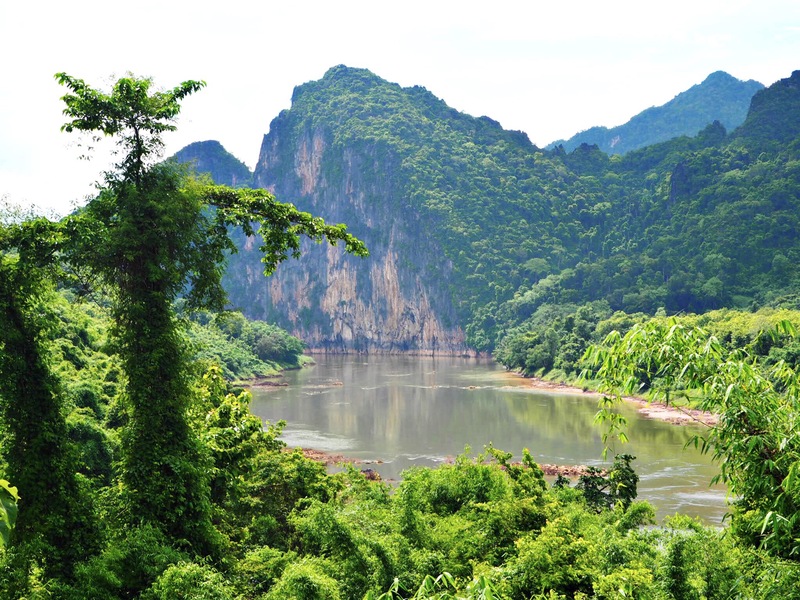 Mountains reminiscent of those in Southern Europe on one side, and the majestic Mekong River to the other. The falls were beautiful, if not a little crowded. 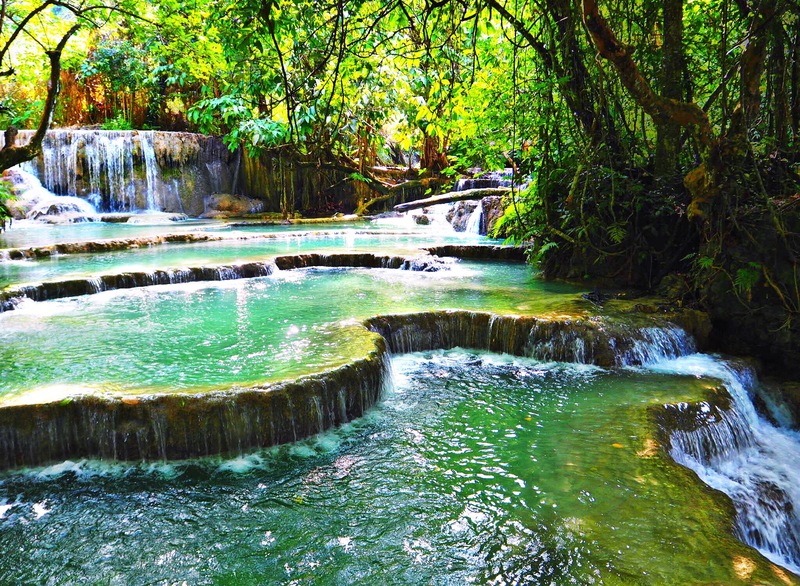 There are a number of different swimming holes, but most of them are pretty overrun. We hiked up a ways beyond the last easily-accessible pool and made it to another, that was evidently meant to be closed off. On our way back down we took a dip in the refreshingly cool waters of one of the lower pools while the resident fish nipped at our feet. For dinner we visited the Lao barbecue (or Sin Dat) joint overlooking the Mekong. 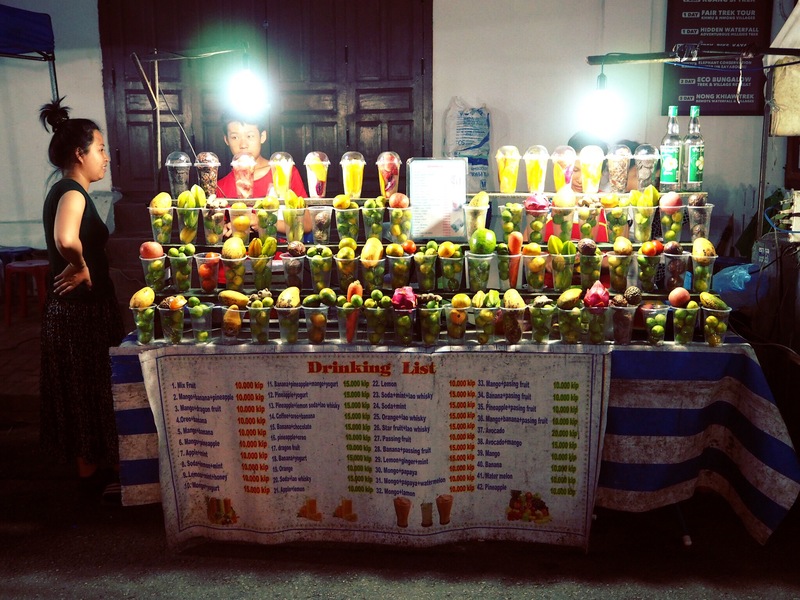 It was definitely a highlight of the noteworthy Luang Prabang food scene. 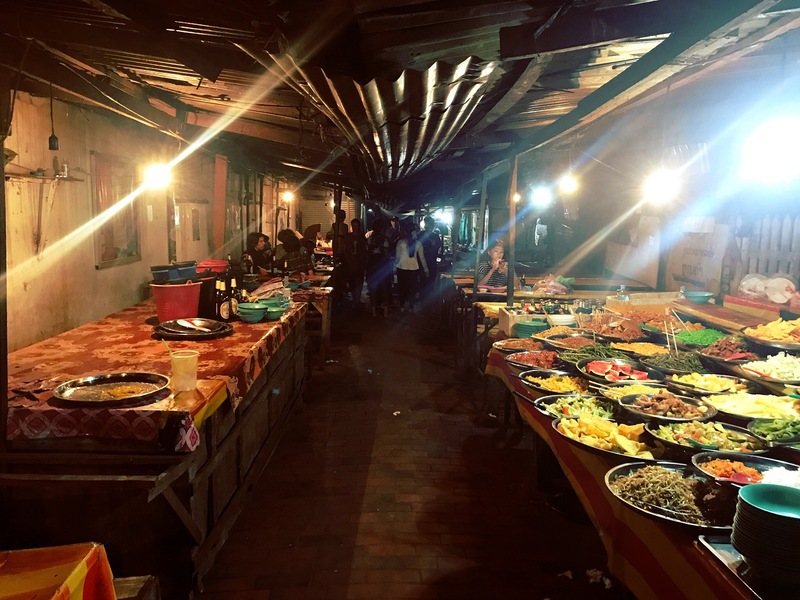 There were dozens of plastic tables laid out beneath some ad hoc floodlights, and the place was veritably popping off with Chinese, locals, and a few westerners. We paid the modest up-front tag of 50,000 kip (around $5) per person, and filled our plates with as much raw meat and vegetables as we could. Each table has a quaint, coal-powered barbecue on it, so in the Korean barbecue style you cook everything yourself. The food was fantastic, and there was a lot of it. Laying waste to some sin dat. The following day we decided to take a bit of a motorbike trip. The Pak Ou Loop, of Travelfish fame, which was pretty fun, and a good way to spend the day. We made a small adjustment to the beginning of the trip, but it mostly wound through very quiet, dirt roads in the hills, into and out of very rural villages in the countryside. Not far into the trip, on an otherwise serene stretch of dirt road, we came upon a huge hole bored into the hillside. The scene was buzzing with Chinese construction workers and machines, and is apparently part of a China-Laos railway that’s currently under construction. A view from the Pak Ou Loop. Our trip took us through Ban Xang Hai, or more colloquially known as Whiskey Village. The village is known for its lao lao, or Lao rice whiskey production, but as we passed through, we were mostly met by scowling locals and abandoned souvenir stands. We did stop at one stand to sample a bit of whiskey, but it was pretty foul, so we opted not to buy a whole bottle and possibly go blind from it. This lack of attention probably drives the resentment, but perhaps a better product would help. The area surrounding the Pak Ou Caves was the highlight of the trip for us though. The caves themselves are fairly unspectacular, by Southeast Asian cave standards, but the road winds up and up after that and offers some amazing views of the Mekong and surrounding cliffs. We stopped for a brief lunch in the village of Pak Ou as well, and waited for a passing rainstorm, which fortunately didn’t last too long. Some westerners rode through on elephants as we were waiting. They looked to be having fun, but the elephants did not. Entrance to the Pak Ou Caves. On our last full day in town we checked out the Xieng Thong temple, which is reportedly one of the best temples in Laos. Perhaps we’re all templed out at this point, but we weren’t extremely impressed, although this could have been due to the 35° heat we had been wandering through for most of the day. As the sun went down, we made a visit to the top of Mt Phou Si right in the middle of town, and got completely drenched with sweat on the way up. The peak was quite crowded with onlookers eagerly awaiting the sunset. It was a nice view, but we headed down before the sun actually set, and met up with Sara for the fourth time this trip. After parting ways in Chiang Mai, she spent more time in Northern Thailand as we headed to Laos, but she got to Luang Prabang the night before we were leaving. We had dinner at the food market, which was pretty nice, if not quite touristy. 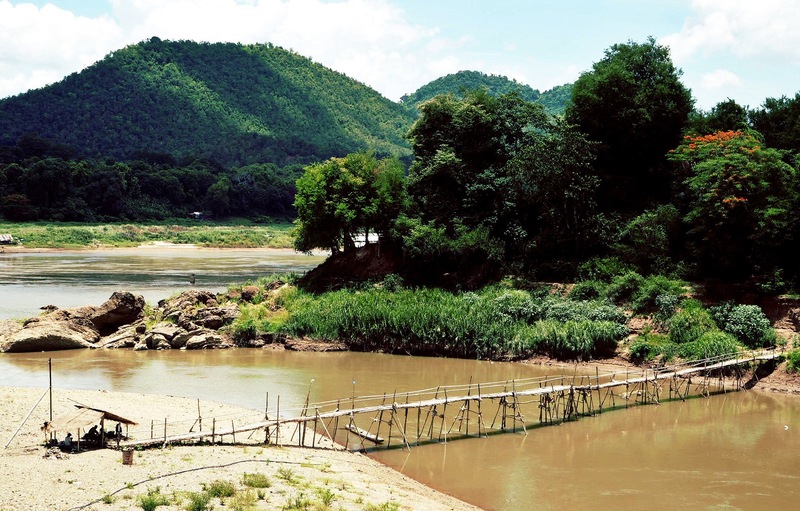 Bamboo bridge in Luang Prabang. Food market in Luang Prabang. The following morning we awoke at 5:30am to witness the famed Tak Bat in Luang Prabang. This is the ceremony where the monks file out into the streets from their temples and collect donations of food or money from the townspeople. We didn’t get out there until around 6am, at which point most of the monks had already made their rounds, but we did see a few groups picking up the last of the morning’s donations, which was nice to see. We had a flight out from Luang Prabang later in the afternoon, and slowly made our way to the airport a few kilometers away. The flight to Hanoi was short, and mostly uneventful, but there was some pretty rough turbulence at the end as we flew through a storm front. The views from the plane were pretty impressive though, as massive dark clouds loomed overhead with dull sunshine battering its way through around the horizon. Full of charm, isn’t it? 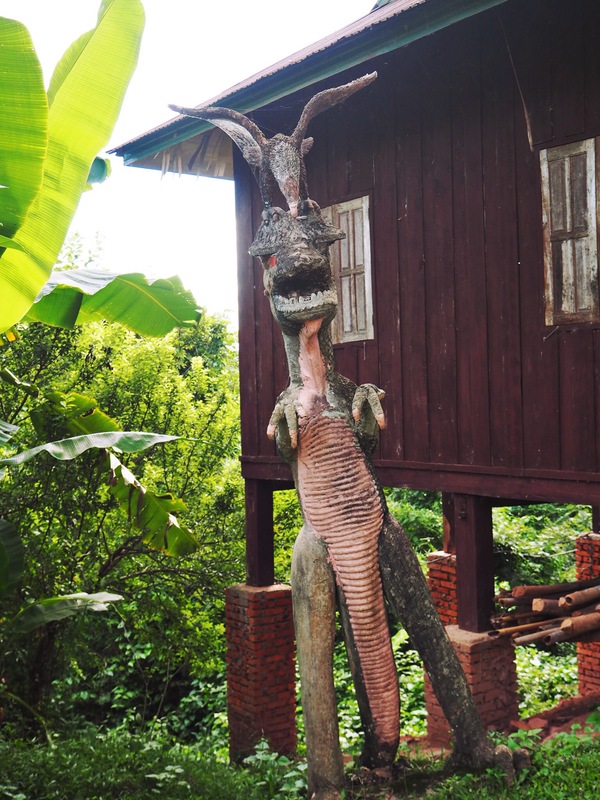 The Kayan commercialized long-necks are just another freak show — a time-honored human tradition. Gawk proudly! 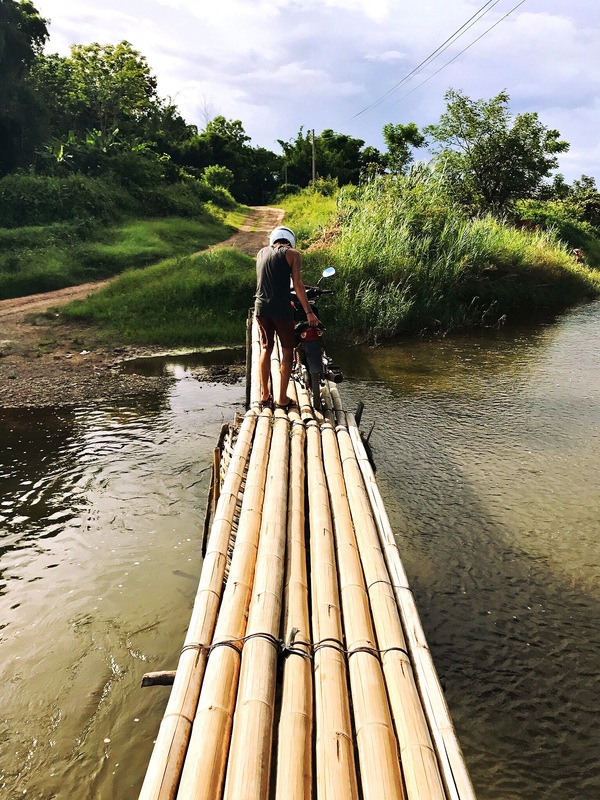 That bamboo bridge crossing does look terrifying! Even a small motorbike can get away from you in a hurry if it tips a little too far. At least you had your safety helmet on. See you in a month, you intrepid travelers!